Asha Gill and Josiah Mizukami were the hosts for the nite. 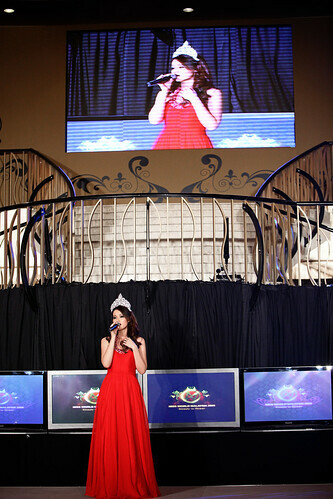 The night started off with songs from Miss World Malaysia 2008 ‘Soo Wincci’ . If I remembered correctly, I think they were trilingual. Wincci is not just beauty. She is talented. 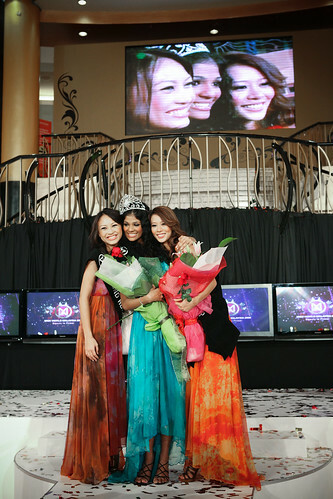 I remember her performing a song which she composed and arranged last year during Miss World Malaysia 2008. Thumbs up to her. She recently released an EP. Go get it guys. It s for charity too. Next up were the contestants. They had paraded in swimwear and sportswear sponsored by Schwrzenbach. Kebaya and evening wear were sponsored by Nazleen Noor label. Besides Wincci, singer and pianist Yew Han gave a solid perfomance as well. Versatile in both vocal and piano, he drove the gals wild with his good looks *angmo look*. StART Society Children Choir gave a very good performance as well. These children are from underprivileged background. I would like to note here, the proceeds from this year’s pageant will go to the society that provides underprivileged children with the opportunity to develop their potential in arts. She can sing. Lovely voice. ~ by beyond on October 7, 2009. Thanks bro Endura. The photos you posted on Flickr were awsome. Good stuff JasonBoy! The COLORS are perfect *wink*! Stephanie Chua is actually my friend’s GF from Penang!